Marty Lukaszewski of Blaine, Minnesota, says, “God gave me a talent to teach.” So he took that talent and became a teacher, working at Minnesota Virtual High School. He works from home most of the week, but on the days he’s in the office he turns a lot of heads. 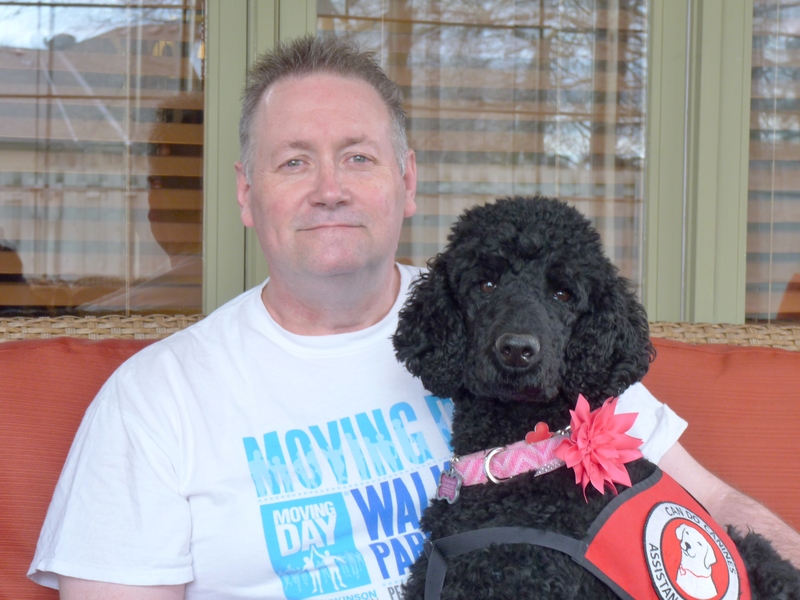 His coworkers come running when they see Marty and his 50-pound black Poodle, Laverne. But she’s not there for looks—she’s there to work, just like Marty. As a Mobility Assistance Dog, Laverne plays an important role in Marty’s life, just like he does in his students’ lives. Marty has Parkinson’s disease. Though he began experiencing symptoms in 1998 he wasn’t officially diagnosed until January of 2014. His symptoms include claustrophobia, tremors in his neck, arms and legs, having no sense of smell, a drop in blood pressure if he stands or bends too quickly, his hands can become rigid, and he can freeze mid-step while walking. He also struggles with balance, saying, “Two hours ago I lost my balance and hit the wall.” Marty attributes his sporadic symptoms and slow progression of Parkinson’s to his active lifestyle. Despite his challenges, Marty has a positive outlook. “I might have Parkinson’s but it doesn’t have me,” he says. Marty applied at Can Do Canines for a Mobility Assistance Dog in October 2016, then in February 2017 he was matched with the sweet but sassy Laverne. She helps with physical demands like retrieving items, helping Marty unfreeze by poking his leg with her nose, pushing buttons, opening drawers, and helping Marty get in and out of a chair. She is also a great motivator for Marty to take daily walks and play ball in their spacious back yard. Even Laverne’s new doggie brothers, Oliver and Winston, join in the game! “Easter Sunday was a very tough day for me,” Marty says. Being in a pew at the crowded church service, Marty could sense everything closing in. “Tremors were very extreme. It was to the point where I was rocking because I couldn’t calm myself down. And Laverne sensed that that day,” he says. “She realized what kind of day it was for me. She planted herself right at my feet … she adjusted without any lead.” Knowing that Laverne was there that day, and would be there for all the tough days to come, gives both Marty and Jean a peace of mind they haven’t had in a long while. Can Do Canines is dedicated to enhancing the quality of life for people with disabilities by creating mutually beneficial partnerships with specially trained dogs. whose purpose is to improve the areas of training, placement and utilization of assistance dogs. Your support provides freedom, independence and peace of mind to people with disabilities. Each assistance dog is provided free of charge.